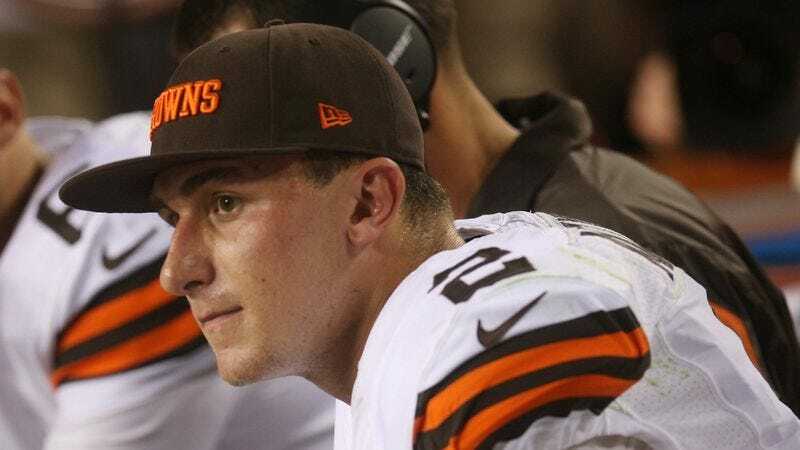 CLEVELAND—Noting that it normally takes several seasons before a tandem develops such a solid connection, Cleveland Browns head coach Mike Pettine told reporters Thursday that he has been extremely impressed by rookie quarterback Johnny Manziel’s growing chemistry with the team bench. “They haven’t had much time together yet, but Johnny is really beginning to gel with our bench,” said Pettine, adding that the Browns coaching staff has been incredibly pleased to see the ease and comfort with which their first-year signal caller has worked with the bench during practices and preseason games. “You can tell there’s a genuine sense of trust and a truly unspoken bond between the two. It’s a very natural relationship, and we’re very excited to see how it grows—so far, they’ve been practically inseparable.” Pettine added that given the way Manziel has clicked with the bench thus far, he believes the two have the potential to eventually become the Browns’ most prolific quarterback-bench tandem since the Brady Quinn era.